Slim and lightweight design allows the case to be carried with you wherever you go. 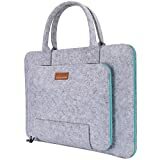 The Laptop case is compatible with 15.6 Asus, Acer, Dell, HP, Lenovo, Toshiba. This entry was posted in Luggage and tagged 15.6, Acer, Apple, Asus, Bule, Carrying, Case, Dell, Felt, Grey, Handle, Laptop, Lenovo, Light, Macbook, Portable, Pouch, Retina, Ropch, Sleeve, Toshiba by Perfect Vacation. Bookmark the permalink.